Save Cost, Improve Security, Streamline Processes. 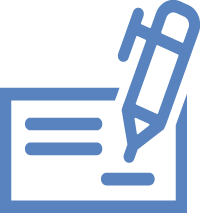 Copy proof printing often involves a specialized printer and expensive custom pre-printed forms. We replace this expensive implementation with a software-only prescription solution that injects security technologies into existing print streams to create tamper-resistant documents on plain paper. The savings from this solution are significant. This technology has been proven for prescriptions and can also be used for other documents such as tickets, permits, confidential documents and more. Reduce printer acquisition cost associated with upgraded printers capable of handling locking trays and the locking trays themselves. Reduce the risk of pre-printed forms being stolen. Reduce secure storage space and vault expenses associated with storing pre-printed media. Increase security and compliance with the Rx form by securely storing it in the OM Plus Software. Get added benefits of the OM Plus base software that reduces queue/destination administration, provides real-time monitoring, alerts, corrective actions, rules-based delivery, job tracking, error logs, print usage logs, detailed security permissions, and much more. 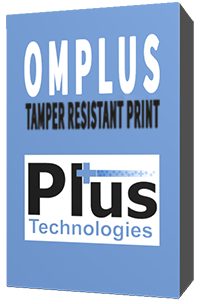 The Plus Technologies Rx prescription solution can take input from most popular EMR systems, parse the necessary data, create the tamper-resistant prescription, and securely deliver it to a laser printer with plain paper. This tamper-resistant prescription will include pantographic and microprint technologies so that any unauthorized copying or scanning is impossible. Get started fast and inexpensively without upgrading your existing printer hardware. Call us today at 877=899-7587 to schedule a demo or to speak to a customer service representative. Customers outside of U.S. can call 1-937-847-0614.